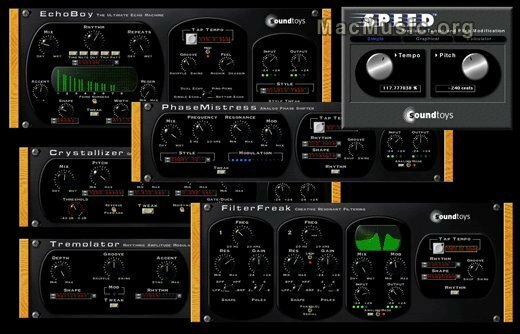 SoundToys has released SoundToys Native Effects V3, which consists of five plug-ins, EchoBoy, FilterFreak, PhaseMistress, Crystallizer, and Tremolator. They are all available in Audio Units, RTAS and AudioSuite plug-in formats for Mac OS X Universal Binary. A sixth effect, Speed, is also included but currently in AudioSuite format only. EchoBoy includes 30 built-in echo styles modeled after various vintage echos (ATR-102, EchoPlex, Space Echo, Memory Man, DM-2, TelRay oilcan delay, etc...). EchoBoy's chorus even emulates the CE-2 chorus, considered a holy-grail of guitar chorus pedals. FilterFreak is a "fat" and "warm" resonant analog filter plug-in, designed to do all the things you do with filters. From funky envelope followers like Mutron, to classic synth style reshaping with ADSR, to big resonant LFO sweeps like the Sherman Filterbank, as well as the classic sound of the old Morley WahWah pedals. PhaseMistress provides classic phase-shifting, emulating the likes of the Bi-Phase, Boss Super Phaser, Phase 90, to the Moogerfooger 12 stage, Small Stone, Trine and many more, with additional features those old boxes couldn't do, like MIDI sync, and a large preset library. Crystallizer combines granular reverse echo slicing and retro pitch processing to create a huge range of radical sonic manipulations and classics with a twist. Use it to create synth-like textures from simple acoustic guitar rhythms, lush detuned echos, or completely psychedelic pitch-shifted reverse echo effects. Tremolator emulates the tremolo effect of classic guitar amps such as the Fender, and even the great tremolo sound of the Wurlitzer electric piano. Add dynamic control of speed and depth that lets the tremolo respond to the music. Then toss in MIDI sync to lock to your tempo. The programmable Rhythm Editor let's you write custom patterns and turns this tremolo into a rhythmic auto-gate. SoundToys Native Effects costs $495. Demo versions are available.